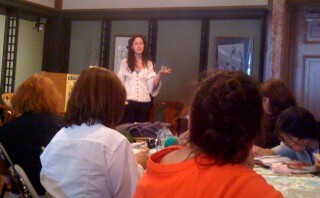 From a knitting and marketing perspective, the NYC Yarn Crawl was great. It made Columbus Day weekend into a knitting event across New York City. Participating stores used the Yarn Crawl as a reason to host an event and/or a sale. Also, there was a scavenger hunt giving knitters a reason to visit every store on the list. For some knitters, this was an enticement to venture out and test out new LYS. Since I didn’t have the time to visit every store, I selectively chose events. I went to a knit along reading at the New York Public Library, held in one of the old rooms on the third floor of the main building on 42nd Street and Fifth Avenue. In addition to listening to a few published knitters, there was a prize draw for books and yarn. The highlight of the event was NeoKnit’s wonderful alpaca lace circular shawl made from Briar Rose’s alpaca laceweight. Ever since seeing it, I have been thinking about making a lace weight, circular shawl. I have a couple of patterns in mind. 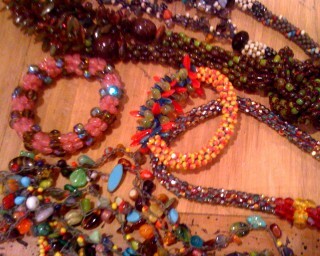 On Sunday, there was a beading event at Annie & Company, an upper east side knitting establishment. I headed over to get additional insight about how to do beading and to see Alyssa, who had been the manager of The Point, and Megan who had also worked at The Point. The beading demonstration consisted of watching a mother-daughter team work on their necklaces with no instruction or insight as to what they were doing. While some of their work was interesting, their attitude was frosty. Instead of trying to entice the women around the table into learning more, they were more concerned that someone might steal their ideas. They could have shown the others, like me, who wanted to know more about beading, a few basic steps. We would have been happy and possibly wanted to do more. If so, we would have purchased their beading kits and/or lessons. I rounded off the weekend with a quick stop at Knitty City on Monday which was crowded. I was able to get the Fall 2009 copy of Vogue International.